Blinke It Away, by Victoria Landis, is now available for Kindle and in paperback on Amazon and in selected stores. The mystery set on Oahu treats the reader not only to great story, but also to an intimate peek beyond what tourists see. Boca Raton, Florida – January 6, 2011 - “It’s rare that a first-time author blows me away like this. Great party, great time, great book!” – Joanne Sinchuk, Manager of Murder on the Beach Mystery Bookstore. 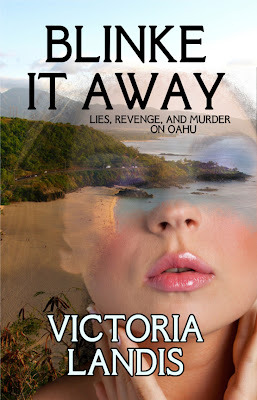 South Florida-based author Victoria Landis debuted her novel, Blinke It Away, at a standing-room only launch party/book signing at Murder on the Beach in the trendy Pineapple Grove section of Delray Beach, Florida, on Friday, December 2nd. Over fifty people jammed into the independent mystery book store for the event. Blinke It Away is about Bess Blinke, a long-time Oahu resident, whose life goes arse over teakettle when her dearest friend is killed. In the following days, while doing her best to pick up the pieces, Bess uncovers terrible secrets about her friend—secrets that send the killer after Bess. Bess must find a way to expose the truth before she, too, is harmed. Much of the action happens in lesser-known places on the island, exposing the reader to fascinating locales and touching on the Hawaiian sovereignty movement. In the end, it’s a testament to true friendship and how that can change people for the better. Upcoming events include features on Kindle Nation Daily in February and March, and multiple South Florida book club appearances. Blinke It Away is available for Kindle and in paperback on Amazon. Signed copies are for sale at Murder on the Beach Mystery Bookstore in Delray Beach, Florida. 277 Pages. $12.95 Paperback. $2.99 E-book. Having lived on Oahu for twelve years, Victoria Landis wrote a novel based there to give readers a truer understanding of how it feels to experience life in Hawaii and interact with the locals. On the Book Clubs page of her website, there’s a glossary of words commonly used in Hawaii and a map of Oahu where event locations from the book are shown. She is a nine-year member of the Florida Chapter of Mystery Writers of America. In 2004, she contributed Chapter Nineteen to the most hilarious progressive novella ever published, Naked Came the Flamingo, edited by Joan Mickelson and the late NY Times bestselling author, Barbara Parker. Victoria writes fiction in several genres and non-fiction as well. Her The Easy Little Diet Book – The Prep Course For Easy Weight Loss Success is available as an e-book. She also writes a monthly humor column for The Parklander magazine. For more information about Blinke It Away, please visit www.victorialandis.com or call (561) 716-3481.